BOTOX® is a neuromodulator that works to interrupt the signal between nerve and muscle, thereby allowing the muscle to relax. When used for cosmetic purposes, this releases tension in the underlying muscle, producing a smooth look on the skin above. For medical purposes, such as the treatment of TMJ, BOTOX® works to release muscle tension and spasticity, which can help with both the immediate relief of pain and in the finding of the neutral jaw positioning, which is essential for further treatment. Uneven tooth wear, chipped or cracked teeth, and other signs may be visible to our dentists, but completely unnoticed by you. These signs of bruxism, typically discovered during routine checkups, can be discussed during your appointments if they are of concern to your oral health and beauty. BOTOX® injections temporarily allow muscles to relax, but they do not turn the muscle off. You will still be able to function normally, open and close your mouth as usual, and bite and chew without difficulty. BOTOX® has a remarkable safety record and, in decades of use both aesthetically and medically, has shown to be an incredibly effective treatment for muscle spasticity and tension. If you struggle with TMJ or are experiencing any jaw pain, call our office to schedule a consultation with Dr. Elisa Mello. With a series of precise injections, Dr. Mello can help relax the activity of the chewing muscles that are causing teeth clenching and grinding, enabling her to determine if additional TMJ treatment is necessary. Because Dr. Mello is extensively trained and experienced in this technique, she knows how to administer the injections in a way that targets specific muscles without affecting the rest of your face. BOTOX® may be used alone or in combination with other therapies for the long-term treatment of TMJ. Additional treatment options include occlusal guards, neuromuscular orthodontics, removable orthotics, and full mouth rehabilitation. The best way to learn which options will best address your needs is through a one-on-one consultation with experienced and caring neuromuscular dentist, Dr. Elisa Mello. 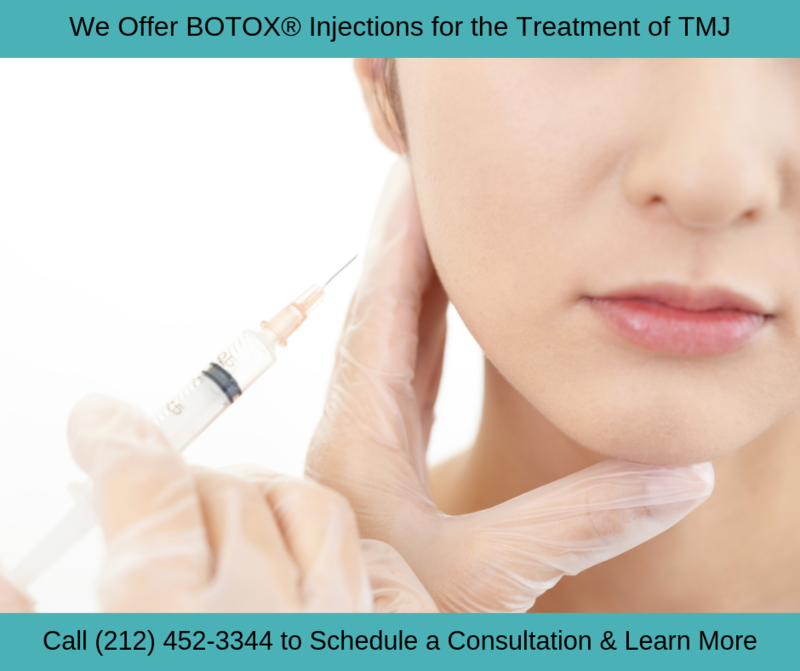 Please call NYC Smile Design at 212-452-3344 to schedule your initial BOTOX® consultation. We provide individualized TMJ treatment for men and women living throughout New York City.